I am spending four days at the Festival of Quilts in Birmingham and having a wonderful time. The first day was a bit rough, as I had to get up really early in the morning to catch my plane from Munich. My travel agent had taken my request for an 'early flight' very seriously and put me on a plane leaving at 6.35 in the morning. Add to that a 50 minute drive to the airport, and the usual time you have to be there earlier - my ever-supportive husband was grumbling a bit indeed when we agreed on the time to leave. No matter that I had asked him before making the final booking, and he had pleasantly agreed to take me. Luckily, my son was still in tennis camp and did not have to come with us. However, I managed to catch a little more sleep on the plane, and then on the train which took me to Birmingham, and by the time I arrived at the NEC I was ok. 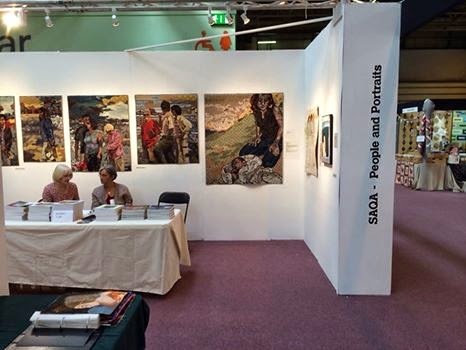 I am doing regular stints at the SAQA table, where the exhibition "People & Portraits" is on display and very well received. And I browse the galleries, taking in so many different and interesting quilts - meeting people again, new people, old friends. Having a wonderful time. And I won't give a report on which quilts I saw and liked, because I couldn't do them justice, and it would take up so much time... You can see the prize winning quilts mady by SAQA-members here. And I am sure there will be plenty of other reports to be found. Looking forward to the last day tomorrow. Lovely to meet up with you again. Hope that you are enjoying the rest of your stay in the UK. And so this is.... summer?